Food & Friends » FOOD & FRIENDS SERVES UP ITS 20 MILLIONTH MEAL! 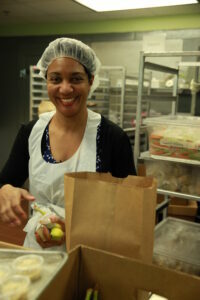 Home > About Us > FOOD & FRIENDS SERVES UP ITS 20 MILLIONTH MEAL! Food & Friends recently reached a new milestone—serving its 20 millionth home delivered meal! Much has changed at Food & Friends over the years—we’ve expanded services, grown into new facilities, evolved our menu – but the personal impact of serving a meal to a neighbor remains a cornerstone of our work. It’s a communal act that, no matter how many times you do it, never fades in its importance. In the early days of Food & Friends, during the height of the AIDS crisis, meals were about providing compassion and calories for clients who were near the end of their life. Today, we serve virtually the same number of people living with HIV/AIDS as when we opened our current building 12 years ago, but we also respond to the needs of adults and children living with cancer and other serious illnesses. Our clients have specific dietary needs as a result of their illness or treatments and may be managing several health problems at once. “Our clients’ needs may look different than in the past. They still have an acute need for our service, but also have complex additional health issues. For instance, we know that folks with HIV are also at greater risk for heart failure and diabetes than the general population. I think our food has come a long way in addressing that complexity,” commented Carrie Stoltzfus, MPH, Director of Program Services. 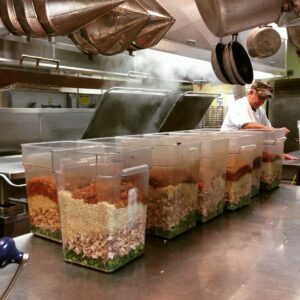 The meals we provide to our clients are not only essential nourishment, but are carefully developed to improve health outcomes and overall well-being. For example, we can now help those with difficulty chewing or swallowing with a pureed or soft meal plan, or we can address their broader health needs with a diabetic, renal, or heart healthy meal plan. More broadly, our staff of registered dietitians and trained chefs have worked together closely over the years to shift our meals and grocery programs toward what’s commonly known as a Mediterranean Diet, focusing on fresh vegetables, whole grains, healthy oils, and lean meats and seafood. The 20 million meals that we’ve prepared in our kitchen have only been possible through the work of tens of thousands of dedicated members of the community, like you. As we continue to evolve as an organization, we know that each and every meal has a direct impact on a client’s life. Here’s to 20 million more!